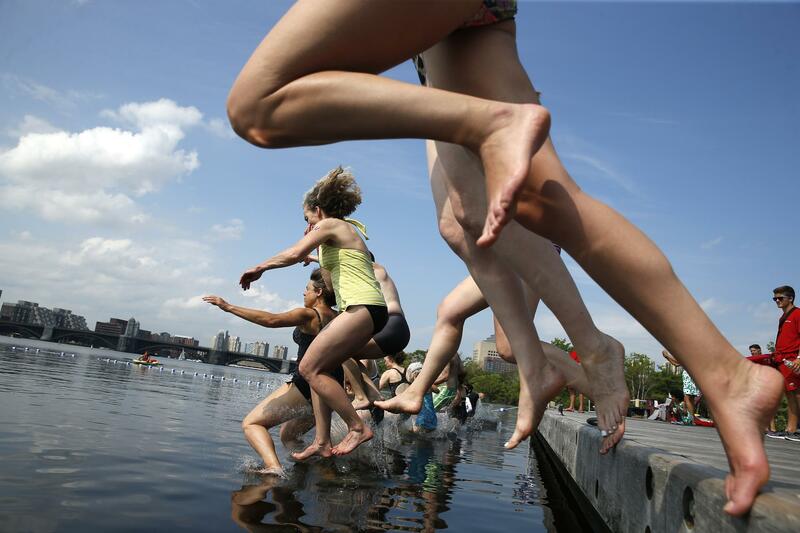 The Charles River Conservancy offers residents the opportunity to swim in the Charles at the fifth annual CitySplash event. The event took place at the Fiedler Dock along the Esplanade on July 18, 2017. City Splash was filmed by Sam Bruce and edited by Zach Ben-Amots. We’ve all heard promises from cities to make their once-fetid urban waterways swimmable—probably too many. Boston has been pledging to extend the Charles River’s swimmable days for years now, while Berlin’s beautiful plans to turn an arm of the River Spree into a naturally filtered bathing pool remain just that—plans. Baltimore’s proposal to render the oft-garbage-y Inner Harbor swimmable via floating islands of pollution-sucking vegetation and a googly-eyed trash-eating boat are edging ever closer to a 2020 deadline, with limited progress so far, while London’s likeable scheme for a Thames Bath remains the preserve of local enthusiasts rather than actual decision-makers. (Meanwhile, when an environmental activist went for a dip in New York City’s Gowanus Canal in 2015, he had to essentially wear a spacesuit to protect himself from the bacteria-laced toxic soup. )Among all these maybes, could-bes, and never-attempts, one city stands out for actually making things happen: Paris. For years, the French capital has been promising to open up its urban waterways for safe, clean public swimming. This month, it’s done exactly that. On Monday, Paris’s Mayor Anne Hidalgo opened-up new open-air swimming enclosure in the Bassin de la Villette, a basin constructed for barges that links the Canal de l’Ourcq with the Canal Saint-Martinin the city’s inner northeast. In temperatures of over 90 degrees Fahrenheit, Parisians lined up to splash about the three new pools fed directly from the canal’s waters, separated from the watercourse’s general flow only by filter meshes to keep leaves and other objects out.Up to three hundred people at any time can use the lifeguard-protected pools, although the pools only have locker space for 80. Located in a part of Paris already popular as a place to stroll in fine weather, the new bathing spot is likely to prove a major hit in an already hotter-than-average summer. Early reports suggest that the water is indeed delightful, though a small residuum of green algae does make a post-bathe shower a good idea. Last week, the EPA released a report downgrading the water quality of the Charles River from a B+ to a B. But that didn’t stop hundreds of people from jumping in the river and going for a swim Tuesday. Nobody seemed to hesitate as they enthusiastically leapt into the Charles. 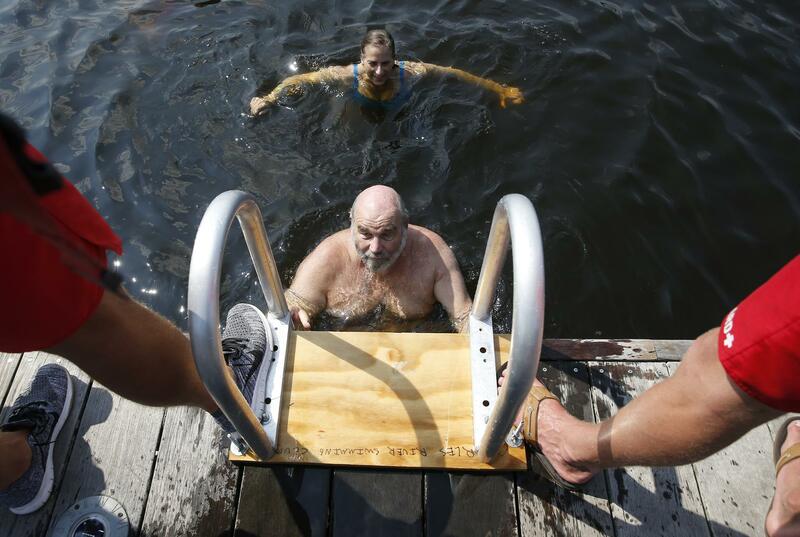 As Sally Graham of Dorchester waited her turn to take the plunge, she said this was something of a bucket list item. As he came out of the water, Josh Posner seemed exhilarated. “The water is great,” he said. “Nice and fresh. Great temperature.” He pointed out, Boston’s a city with a river just right there. That’s what the Charles River Conservancy believes. SJ Port is with the group, and says although this is just a one-day-a-year event, they’re hoping in the future it will be more regular. The question people might have, of course: Is it safe to swim in the Charles? Port says yes. “It is safe to swim in the Charles, as long as the water quality is tested beforehand,” she said. Port wasn’t discouraged by last week’s report that downgraded the Charles from a B+ for water quality to a B. The EPA report was based on monthly water sample tests. The Conservancy hired Max Rome, an environmental engineering graduate student at Northeastern to test the water quality every day this summer. Rome pointed out that Boston has forgotten that back in 1940, people used to swim in the river off Magazine Beach in Cambridge on hot summer days. “What happened since then was that as we started caring more and more about sanitation, perversely we built more and more wastewater treatment plants and sewer systems that ended up dumping into the river,” he said. In recent years, though, since the cleanup of Boston Harbor began, we stopped that kind of dumping and the water quality has improved. So, it’s actually cleaner in the more urban area. Another concern these days is outbreaks of a blue-green algae known as cyanobacteria, which is pretty toxic. But Rome says that tends to show up later in the summer, when the water gets warmer. It was a sunny one, and pretty hot. Port gave one more guarantee this was a good idea: “This is safe for your health, it is good for your health,” she said. And that was enough to encourage anyone, including a radio reporter, to jump in the Charles. People dive into the Charles River during the “City Splash” event, Tuesday, July 18, 2017, in Boston. 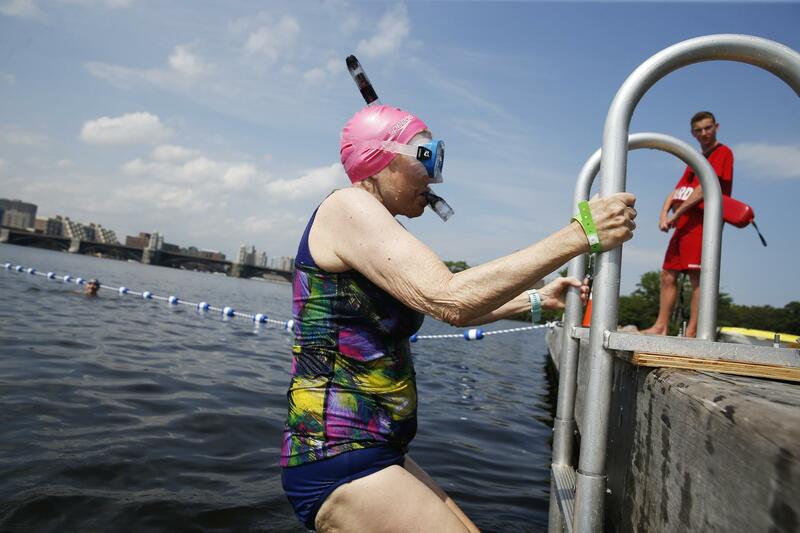 For the fifth year in a row, intrepid swimmers get a rare chance to beat the summer heat with a dip in the once notoriously filthy Charles River, where conservationists are working to build a permanent swim park. The event, now in its fifth year, spotlights the nonprofit Charles River Conservancy’s efforts to build a permanent feature on the river that would allow visitors to enjoy the water without coming in contact with any leftover contaminants. They call it a “swim park,” which would include floating docks for swimmers to safely jump into the river without touching the hazardous bottom. The water quality would be regularly tested. In Boston, the Charles River Conservancy still needs to raise a few million dollars and garner approvals from state, federal and city agencies. Hundreds signed up for a chance to swim in the “dirty water.” WBZ-TV‘s Jim Smith reports.